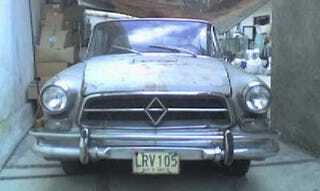 I'm Looking Borgward To Death! I must say I was a bit startled when this '69 Borgward went for $3200 last night. But then, as the seller puts it in his item description: "Remember Borgward is german engineering." Yes, mid-50s low-budget German engineering, built in Mexico 10 years after the company went bankrupt and sold off all its tooling. Yet... there's something strangely appealing about this Borgward; maybe it's the fins, or that oddball engine. Thnderblt Picks Up Thor&apos;s Gauntlet: Der Wartburgamino!